There is a scientific fact that states hot air rises, and will travel until it is stopped by a barrier that is sealed to keep the warm air in. For homeowners, this creates a problem that has a solution and it involves a small retrofit of the attic. 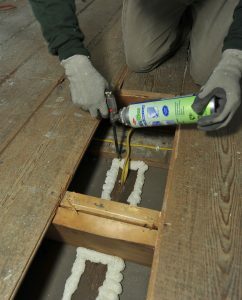 Air sealing the attic before an insulation upgrade can pay huge dividends now and in the future. Experts have told us many times a home’s heat loss – 40 per cent of all heat – is lost through the attic due to improper insulation and air sealing of the attic. That is money going right through the roof, and most homeowners are unaware that they have inadequate insulation and poor air sealing in their attics. For the costs of upgrade to the attic insulation and air sealing, a homeowner can recover the money that is going through the roof and ensure savings going forward. If you home is a few years old, the attic insulation and the air sealing may be less than adequate allowing heat to escape through small holes or leaks that allow air infiltration into your attic in your attic causing your heat bills to climb because you are using more energy than you need. Air sealing the attic in combination with a top-up of attic insulation can reduce your fuel consumption by as much as 30 per cent and help reduce your carbon footprint. Our attics are the home to many of home mechanical systems that power our houses. Ductwork and electrical wiring are housed in our attics and holes are placed in the sides of houses that allow the ductwork, piping and electrical wiring to connect to the service areas. Those holes, while they may have had an air sealing in the past, could be subject to shrinkage of the caulking used to close up the small open areas. That is where the problems start, because leakage is occurring and the homeowner isn’t aware of it. And it is a problem all year long. In the summer, hot air that invades the attic causes the air conditioning system to work harder to cool the home and that also increases the home’s cooling bill while air conditioning the great outdoors because there isn’t proper air sealing in the attic. The most problematic area for air sealing your attic is around the perimeter of your attic. 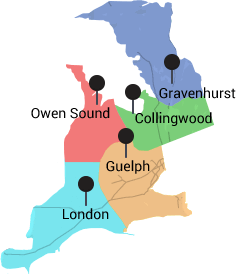 It is the hardest area to get to and because it meets the walls of the house, leaks can be prevalent due to the settling of the house in its foundation and that creates gaps along the perimeter leaking hot and cold air. If you have had roof damage or an infestation of rodents or birds in your attic your air sealing could be compromised by the invaders gnawing through the air sealing to get into a warm area to nest and populate. Certainly we all want to improve our energy efficiency though an attic retrofit, but before you run out to the local hardware store to stock up on insulation and plastic, talk to an expert who can guide you through the process. 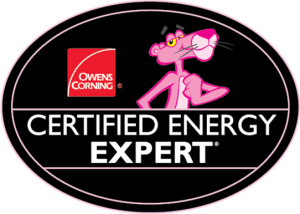 The insulation expert will be able to assess your needs and make recommendations that will be the foundation of the plan to increase your energy efficiency and save you money in the process.